Tape it up on your blog somewhere. 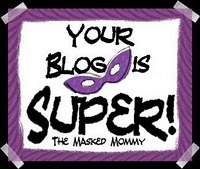 Pass it along to 5 fellow super bloggers, and comment on their blog to let them know how lucky they are today! When you present your Super Blogger awards, link back to the super blogger who gave it to you. Hallo Stephanie! Vielen Dank für den Award, ich freue mich wirklich sehr!